The last edition of the encyclopedia will be the 2010 edition, a 32-volume set that weighs in at 129 pounds and includes new entries on global warming and the Human Genome Project. been sold, and the remaining 4,000 have been stored in a warehouse until they can be purchased. Sad. 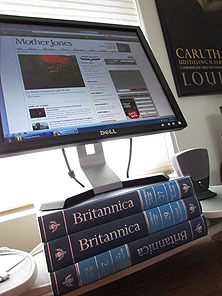 I have a 1993 copy of the Britannica, purchased in 1994 for about a hundred dollars. I never cottoned to the macropaedia/micropaedia thing, and like everyone else, pretty much stopped using it once the internet became the font of all knowledge. As you can see, today its primary use is to lift my monitor to eye level, which I suppose is especially humiliating when I’m using the monitor to read something from Wikipedia. But it had a good run. R.I.P Encyclopaedia Britannica.